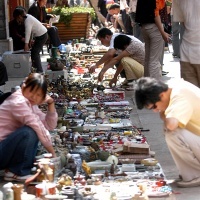 The Flowers and Birds Market (aka The Jewelry, Flowers and Birds Market) in the old street, is the biggest and famous of its kind in Kunming, it is the most interesting attraction within the downtown area of the city. This comprehensive public market is for leisure, shopping, eating and trading. Rambling on the market street, you can see hundreds of shops and stalls of all kinds. The Kunming Jewelry, Flowers and Birds Market is a great place to shop for a lot of different things like birds, birdcages, flowers, insects, fish, antiques, jade articles, jewelry, ink stones, porcelains, potteries, stone carvings, clothes, name chops, dice, outdoor equipment, camping and hunting gear, live baby turtles, movies, music, games, dried lizards on sticks, and marble products...It is a treasure trove for tourist souvenirs. If you have a visit to this market, do not miss the shops that sell colorful ethnic costumes with headdresses. Most are handcrafted and very popular with tourists from home and abroad. Their prices are reasonable, and you may even bargain with the shopkeepers. Many artistic old-style buildings are well kept in the market, which are now home to the shops and Western restaurants. Here not only can you taste the delicious local food but the authentic western food. You can also make a stop in the tea house for a cup of tea. 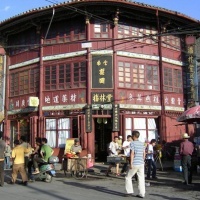 The market is located in Dongfeng Lu (near the provincial Museum). It is open roughly from 9am to 6pm, but all of the individual shopkeepers keep whatever hours they like.